Change at McGill University is most often defined by incremental progress rather than overnight transformation. 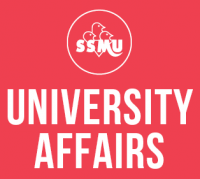 During the 2016-2017 year, the SSMU University Affairs portfolio has successfully pushed forward numerous initiatives to address critical academic, equity, and support issues facing undergraduate students. The University Affairs Final Report highlights some of these collective achievements in the areas of mental health, sexual violence, student rights, accessibility, and more. Thank you to the many staff, senators, committee members, councillors, and volunteers who have made this work possible!